Linoleic acid Market size was over USD 2.2 billion in 2017 and industry expects consumption of above 1 million tons by 2024. Growing influence on bio-based material mainly for usage in paints & coatings and adhesives applications owing to environmental concerns from petrochemicals products will drive linoleic acid market size. Increasing importance of daily health management and rise in personalized nutrition trends along with growing demand for natural ingredients in nutritive products will boost product demand. Linoleic acid is a polyunsaturated fatty acid which is essential for healthy hair and skin, as well normal brain function. It can be synthesized naturally by humans or consumed through various food ingredients and is also utilized in oils and quick-drying soaps and several other industrial applications. Global dietary supplement market may exceed to USD 275 billion and is likely to grow by 8.5% by 2024. Attractive nutritional value of product tends to foster its utilization in dietary supplements which helps in weight loss and retain lean muscle mass. Rising obesity incidents in U.S, Germany, UK due to instable diet patterns along with long working hours and high adoption rate of packaged food items is anticipated to increase consumer spending on supplements which may favour linoleic acid demand. Established health & nutrition claims and intake recommendations from EFSA have led to product innovations, mainly in the European market thereby promoting regional industry growth. Supportive regulatory regimes regarding functional foods & nutraceuticals labelling and marketing claiming health benefits along with recommended dosage are appealing to consumers. Shifting trends toward additional benefits in dietary supplements along with consumers inclination toward observing products for specific claims and multifunctional products may drive market growth. Ethyl linoleic acid is an unsaturated fatty acid, derivative of linoleic acid. It is used in cosmetics for its antibacterial and anti-inflammatory properties and is reported to accelerate healing of wounds and clinically proven to be an effective anti-acne agent. Consumer adoption for organic ingredients over synthetic chemicals mainly in anti-ageing cosmetics supported by availability of varied premium natural skincare products will propel industry growth. Vegetable & nut oils including sunflower, corn, rice bran, walnut, cotton, rapeseed and safflower are the essential raw materials. Rising demand for vegetable oil in food & beverage, biofuels and paints may affect these raw material supply for commercial production which may limit industry profitability, thereby affecting linoleic acid market price trend. Linoleic acid market size from food & beverage applications will surpass USD 1.5 billion during projected timeframe owing to paradigm shift in consumer consumption pattern and increasing preference for healthy lifestyle. Global food & beverage ingredients market was valued over USD 55 billion in 2017 and expects gains at over 9%. Increasing health benefits from this product is attracting its application in flavouring, aroma component, dairy and baking industries. The product demand is anticipated to rise as it helps to reduce risks for type 2 diabetes, hypertension, and strokes. 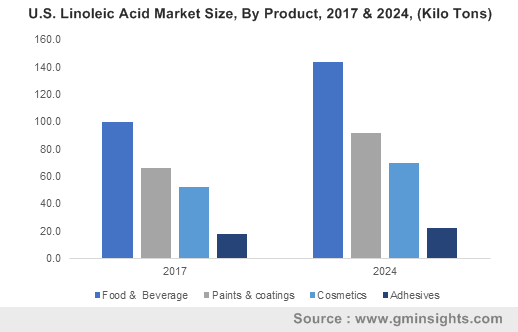 Linoleic acid market size from adhesives & sealants may reach up to 65 kilo tons by 2024. It is utilized in adhesives & sealants owing to its colour stability, low rosin acids, and unsaponifiables content. Administrations and associations are standardizing the adhesives products emissions to protect the environment which would drive the product growth in adhesives & sealants application owing to its environment friendly nature. 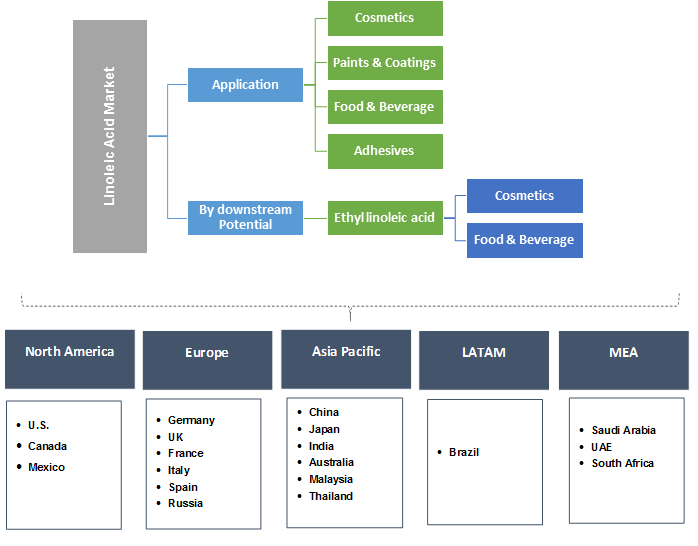 Asia Pacific driven by Japan, India and China linoleic acid market size is projected to surpass USD 1 billion in the estimated timeframe owing to its increasing application range in protective coatings for color retentive and fast drying alkyl & epoxy resin ester coating production. Growth in automotive production supported by rising demand for premium quality automobile mainly in India and China will favor paints & coating demands, thereby promoting industry growth. Increasing construction spending supported by expansion in public infrastructural projects may drive demand for paints & coating, acting as another contributing factor towards regional industry growth. Europe led by Italy, France, Spain, and Germany linoleic acid market may observe significant gains up to 4%. Rapid product inventions pertaining to natural cosmetic ingredients supported by rising consumer inclination towards natural antiaging skin care products may fuel product demand. Presence of major manufacturers and premium cosmetic brands will have positive influence on industry growth. Brazil is anticipated to experience an increasing demand for linoleic acid owing to its utilization in dairy products, animal feed, and home care products. The market growth is driven by the growing awareness about its health and medical benefits. Global linoleic acid market share is highly competitive and moderately consolidated with key industry participants including Eastman Chemicals, Merck & Millipore, BASF SE, Cayman Chemicals. Other industry participants include Lluch Essence SI, Synerzine, SA Pharmachem Pvt. Ltd., Sisco Research Laboratories, and Avantor. Manufactures are concentrating on developing new products and revolutionizing on the use of different components to hold their existing customer base and increase their market share. They are also investing heavily in R&D to sustain the changing market dynamics. Linoleic acid supports to maintain overall health and strengthen body’s natural defences by suppressing inflammation and treatment of atomic eczema. It finds application in cosmetics, food & beverage, paints & coatings, and adhesives & sealants. Application potential in high performance pressure sensitive tapes supported by technical advancements in production methods will surge product demand.